Looks like I've dropped out of range of the Bunnies auspex for a while again. I had a longer break away from the hobby than expected but I'm back! 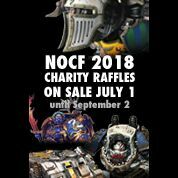 Despite the break, I've made a few decisions about how I'm approaching Adeptus Titanicus - mainly, I'm not going to be doing Ignatum as my first legio, I'm going to do Defensor instead - when the Warhammer Community did some of the previews for Titandeath, I fell in love with the Nova Guard colour scheme, great contrasts so I decided to jump ship! My second legio on the other hand I'm no closer to deciding upon - I need it to be a traitor legio but I really can't make up mind, completely open to suggestions! 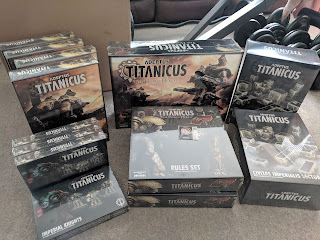 Over the next few weeks, I'll share my progress building and painting my titans. 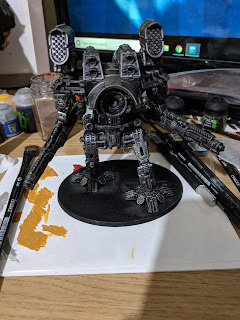 I built and primed my 5 Warlords, 6 Reavers and 18 Questoris Knights before my break and I have 2 Melta Reavers, 8 Warhounds, 6 Cerastus Lancers and 4 Warlord Plasma upgrade sprues to build and prime and then I can start painting it all in anger! How's everyone progressing with their projects at the moment? Also, any suggestions on traitor legios? Slowly on the 28mm Warlord and ploughing through a Vanguard Skitarii Squad for Squaduary. That is a fair few Titans you have there! Defensor looks great, maybe flaming yellow Fureans as the traitors? I’d suggest waiting for the next AT Campaign book for Traitors. It’s got two Traitor Legios in there that have not had schemes before. Legio Vulpa is something you don't see often. 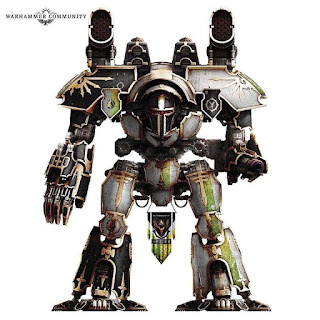 Their sheer cruelty and worship of Khirne is also a great contrast to the pious nature of the Legio Defensor.